We help by providing goods, services and/or funding to help the animals at the Taylor Animal Shelter get what they need while they wait for their forever families. Volunteer to help at one of our upcoming events! Stay tuned! Watch this space for the latest. We are a small but passionate group of volunteers! 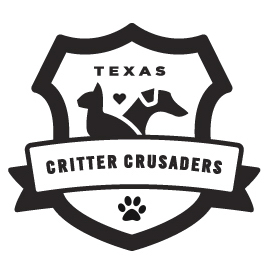 Texas Critter Crusaders is a nonprofit organization dedicated to helping the animals at the Taylor Animal Shelter. Our goal is to fulfill the unmet needs for the animals at the shelter through fund-raising, volunteer work and donation drives, and to provide those goods, services or funds quickly to the animals when they need it to help them thrive and find forever homes...Learn more. For the cost of a couple of large lattes, you can help several of our most special critters with these pressing needs.